Snow Leopard, the highly anticipated new operating system for the Mac, will be released ahead of schedule Friday, Apple announced Monday. 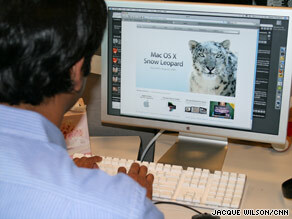 The Mac OS X Snow Leopard will be available as an upgrade to the current Leopard system for $29 and can be pre-ordered now, the company said. “Snow Leopard builds on our most successful operating system ever, and we’re happy to get it to users earlier than expected,” said Bertrand Serlet, Apple’s senior vice president of software engineering. “For just $29, Leopard users get a smooth upgrade to the world’s most advanced operating system and the only system with built-in [Microsoft] Exchange support.” The company said in a news release that, for Snow Leopard, Apple engineers refined 90 percent of the 1,000 projects that currently make up its operating system. Among the anticipated features will be what Apple promises to be faster applications, including e-mail and Web browser Safari 4, while freeing up 7 GB of drive space, compared with the current system. An upgraded QuickTime system will let users more easily view, record, trim and share video, the company said, and it will include improvements to the system’s iCal calendar, podcast producer and wiki server. The system had been scheduled for a September release date. But speculation in recent days had centered on an earlier release. Apple rival Microsoft is set to release Windows 7, a new version of its PC operating system, on October 22. Mac users were reporting that Apple’s online stores were unavailable Monday morning, presumably to add the order page for Snow Leopard. The announcement Monday created the buzz typical of any Apple announcement among the world of devoted Mac users. Both “Snow Leopard” and “Mac OS X Snow” had become trending topics on Twitter on Monday morning — with response mostly positive. “Ordered already: I’m just one of those nut cases,” one user wrote. Can Apple beat the too-expensive rap?